Productivity isn’t only about our jobs and our to-do lists. The same concepts that help us produce work in the office can also help us tackle personal creative projects. Just ask Grant Faulkner, the Executive Director of National Novel Writing Month, a.k.a. NaNoWriMo—the annual challenge where ordinary people commit to writing a 50,000-word story in just 30 days. Evernote is proud to be an official sponsor of this annual creative explosion. Grant has heard all of the excuses we have for not acting on our creative impulses, from a lack of time to the notion that we simply aren’t creative. 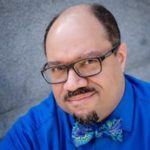 He demolishes these myths and offers a way forward in his new book, Pep Talks for Writers: 52 Insights & Actions to Boost Your Creative Mojo. Let’s start off with your day gig. You are the executive director of NaNoWriMo, which is something people might have heard of and might be wondering what this funny acronym is all about. Focus on the syllables here. Na is for National, No is for Novel, Wri is for Writing, and Mo is for Month, so National Novel Writing Month. That’s the largest writing event in the world. Last year, we had 312,000 people sign up for it. This year, from our early indicators, we are expecting more. In its most rudimentary form, it’s a challenge to write 50,000 words in the month of November. Just to expand a little bit on why we do this, we believe that everyone in the world has a story to tell. In fact, I just read a survey that 81% of Americans say they would like to someday write a book, but someday doesn’t happen for most of them. We are all about making that dream of ‘someday writing a book’ happen now, through setting a big goal of 50,000 words and having a deadline of 30 days. Those are creative igniters or creative midwives to help people write. how many people actually manage to complete the challenge? About 15% if I was going to pick a one general figure. This year, roughly 45 to 50,000 people will complete a novel, which is huge. Oftentimes people will apologize to me for failing in NaNoWriMo and they’ll say something like, “I only wrote 10,000 words.” Even though some people might not hit 50,000, I don’t want them to think of themselves as failures because if you write 10,000 words in a month, that’s significant. If you do that for 12 months, that’s 120,000 words and that’s a huge novel. I recommend everyone sign up and just give it a shot and don’t quit. If you fall behind on your word count goal, keep going. Just give it a shot and don’t quit. If you fall behind on your goal, keep going. You’ve undoubtedly seen a lot of the challenges that people face when writing projects, especially if they are doing it for the first time. Now, you’ve got this book, Pep Talks for Writers. What prompted you to write the book? One, I talked to a lot of NaNoWriMo writers. I heard a pattern after I’d been here for a few years. I talk to a lot of writers who discovered themselves as writers during NaNoWriMo. They love the NaNoWriMo community. They wanted to keep writing 12 months of the year, but it’s hard to do that. NaNoWriMo is a huge experience and you can make creativity a priority for a month. You can do that in part because you’ve got all these people around you cheering you on, but the next 11 months are more challenging because that community isn’t there in a big way. I really wanted to write something that would help people stay creative every week of the year—hence, 52 essays—and really finish their novel and to take that creative momentum that they’ve established during November and keep it going throughout the year. That was my genesis of the book. I hear that a lot. Two rationalizations of why people can’t do NaNoWriMo. One is “I don’t have enough time.” I hear that most frequently, but the second one I hear and this is the one that actually disturbs me the most is that people will say, “I’m not a creative type.” It hurts me to hear that, actually. We are creators because we are human. We are wired that way. It’s in our genes. To say that you are not a creative type is really shutting down a huge portion of who you are and just not letting it out. You are just limiting yourself, and NaNoWriMo operates on the opposite principle. We are creators because we are human. To say that you are not a creative type is shutting down a huge portion of who you are. You are a writer because you write. You’re a real writer. You don’t have to be published to be a real writer. You are a writer because you write. Creativity for creativity’s sake is good. By participating in NaNoWriMo, by realizing that you are a writer and that you are a creator, you are much more likely to be creative in your everyday life and that means creative as a parent, as a boss, as an employee, as a citizen. That’s the kind of creativity we need to make the world a better place. Thank you for pointing that out. I actually like that a lot too. I think sometimes we think of inspiration as this big glorious thunderbolt from the sky and that we can’t do anything creative until that somehow kind of strikes us—until we have one of those light bulb moments. You create inspiration when you sit down to write. It might not be the equivalent of one of those thunderbolts, but you are creating. I think inspiration is whispering to you between each word. It’s small, small moments of inspiration and you might not totally recognize it, but it’s happening with each sentence because one sentence spawns another sentence and spawns another sentence. It’s just about getting those words on the page. I like this quote from William Faulkner who said, “I write when inspiration strikes and inspiration strikes every day,” something like that. Exactly. I think, especially with the rough draft, too many people will write the first sentence of a novel or first paragraph or even the first chapter and then they’ll go pick up one of their favorite author’s books, or even just any published author. Those books are so polished and perfect. What is not apparent is the number of drafts that the author went through, in excruciating fashion, to get them to that perfect state. And the author had an editor as well, and an agent. I think that that’s a bad way to measure yourself as a writer. Everybody’s rough draft is a crappy rough draft including those award-winning authors. I guarantee you. I wish that some of the big authors in the world would show us their rough drafts because I bet they don’t look too much different than our rough drafts. I recently heard this quote from Barbara Kingsolver and she said that she actually starts at page negative 100. She doesn’t even count the first 100 pages because she is writing just to explore and find her story, and that’s largely what a rough draft is. You have a story in mind and sometimes you might have outlined it in ridiculous detail, but the writing process of that rough draft is still exploratory. If you get hung up on making it perfect, you’ll likely not hit the last page. Have you ever met a person who says they are not busy? Our busyness is at least in large part a perception. Obviously, there are a lot of very busy people in the world, but I think sometimes we think we are too busy to do new things or big things. I think if those things are really important to us, if we really want to make creativity a priority for a month to write a novel, we can find a way to do it. I say this from personal experience and dealing with hundreds of writers who I’ve talked to personally. What I do, and I’m just going to give this as a simple tactic for any listener who think that they are too busy, is go on what I call a time hunt. Spend one week of your life keeping track of how [you] spend [your] time. You can do it in 15-minute increments or half hour increments. I think when you do that, you’ll realize how much time you spend on things like social media or binge-watching Netflix, even walking your dog or cooking meals. Some of these things are practical matters of life. Most people can structure their life in a way that will give them the two to three hours a day to write a novel. I need two hours a day, so I cut out social media. I cut a lot on my TV viewing. I make a promise myself to say no to most parties or dinner parties or occasions like that during November and I come up with a strategy where I can find that two to three hours a day to make it work. I think most people can do that. The next step from that, once you’ve made some of those hard choices and you’ve carved out a little bit of time is to get into the habit of using that time. You talk a lot about the importance of routine. I’d like to dig into that. I say in the book that ‘routine’ is another word for ‘muse’ and it goes back to creating your own muse by putting words on the page, just writing regularly. You need to do that to keep creative momentum. If you’re going to drop in on your writing for one or two days a month, it will be hard to like keep the ball rolling. You’ll always be starting from scratch. I think you need to form a routine where you do it regularly and to try structure your life for that. If you’re going to drop in for one or two days a month, it will be hard to like keep the ball rolling. You’ll always be starting from scratch. Maybe we can’t all carve out two hours like you mentioned every day, but even if you’ve only carve out a little bit of time to write in a routine manner, it really adds up. If you can write 250 words a day, that’s 7,500 words a month. At the end of the year, you’ve got a good sized novel’s worth of writing done. 90,000 words, isn’t that amazing? I’m a working parent and a writer in addition to my day job. Especially when I became a parent, I had to totally change. It totally changed my writing life. My routine was not as expansive and as glorious and as regular as I might have liked. I had to strategize and look for the nooks and crannies of the day, the 10 minutes here or the 15 minutes there where I could write that 250 words. As long as you are keeping your juices alive, I think that’s what’s mainly important. I’m going to tell just one little story on this note, which I’ve always found this very inspirational. Toni Morrison, she was a single working mom living in New York City. She didn’t have much time. After she finished the homework with them and got them to bed, she literally had about 15 minutes before she went to bed herself. In that 15 minutes, which was like the worst creative time in her whole day, that’s where she wrote her first novel. Just 15 minutes a day. We can get into the trap where we are engaged in fake productivity. We are having activity, but we are not actually moving forward. What are some examples of that? Some people can spend their whole lifetime researching a novel. I think writers, you need to know where to strike that balance. Do you really need to research everything before starting? I think generally the answer is no. I think it’s best to write the story and go for it and then look for what you need. You need to do a certain amount of research to feel confident about the topic depending on what the topic is, but then there’s a lot of research you can do afterwards. I think things like that become rationalizations of why you are not going to write. For me, before I did NaNoWriMo I wrote with a kind of ponderous preciousness. I would have to get that first chapter or those first two or three chapters just perfect before I could move on. I was just spending an inordinate amount of time tweaking sentences and cutting and pasting things. I really wasn’t moving the novel forward. That’s where there was fake productivity for me. I was doing a lot of work and a lot of tweaking, but I wasn’t really moving that much closer to the end point. It also made the time I spent on each section of the novel very skewed, like I might spend 50 or 60 percent of my time on the first act and 20 or 30 percent on the second act and then barely any time on the ending. One reason I think the productivity of NaNoWriMo is really good is because you are constantly focusing on moving the story forward and progressing. You can measure it in the words you write every day, your word count. What about writer’s block? I know you’ve said there’s no such thing. If there is no writer’s block, what is going on in our heads? I say that. I know it’s controversial to some people. I tweeted that a few months ago and I got a lot of flak from certain people. Writer’s block is this sort of accepted notion and I don’t think it should be such an accepted notion. I think there’s a lot mythology build up around it. The stereotype of the author who hasn’t written in years and years. I think that writer’s block is largely self-imposed. It’s largely a story you tell yourself. You tell yourself that story when you’re not writing, when you’re not sitting in front of your laptop or in front of your Moleskine journal. That’s where the NaNoWriMo word sprints come in so handy. You can write in a burst for five minutes and it doesn’t have to be perfect. You are not supposed to even revise the grammar or anything, just get the words out. I think when you put one sentence on a piece of paper, it leads to a second sentence and a third. It’s just about getting some words down and it’s amazing what happens. During those word sprints, it taps into a mysterious part of our brains. We are not planning the words to write or the story we are going to write. It just comes. It only really comes if you’re writing. It’s not going to come if you’re sitting there staring out the window. It’s really about sitting down and just putting some words down and you can start out with just absurdities. You can start with a few observations. It doesn’t have to be about your novel. The thing is just to start writing. It only really comes if you’re writing. It’s not going to come if you’re sitting there staring out the window. That’s exactly it, I think. When you give it a name, you give it power. There’s no reason to give it that power. There are so many ways around it. You can, as you say, just write some nonsense, just freestyle it for a while, just do a sprint or you could skip ahead in your story if you have an idea of where you’re going. You don’t have to write the next scene next. Exactly. I recommend a lot of skipping. I love skipping ahead or back a lot. I was going to also say that one of the chapters in Pep Talks goes through Ray Bradbury’s process when he first became a writer. He did this cool thing where he would write just 20 nouns down and they would be random. Then, he would write what he called little pensées, little 100 or 200 word tiny essays about each word. By doing that, he would find his story and actually some of his most famous books came from that process. There are so many different ways to inspire yourself out of writer’s block. You can grab pictures on the internet and put them in Evernote. I did that with one novel to have some visual images to guide my novel. I think there’s just a lot of cool ways to not accept writer’s block. I have one more thing I wanted to ask about and this is also from your book. The concept that we are going to fail, but when we fail, the key is to fail better. What do you mean by that? I think there are a lot of different ways to interpret ‘failing better.’ At its most fundamental, failing better means actually seeking failure out by taking risks. The best novels take risks. The author is opening up his or her heart in a way that helps us connect with the story and that’s a risk. There’s something like beyond that for writing because I think it was Philip Roth who said like a really good baseball player hits the ball 30 percent of the time and that stat goes for a writer as well. Most of your sentences, especially in that rough draft, are going to be misses or they’re going to need improvement. I think you have to accept that to start, accept that you’re going to miss the ball more than you’re going to hit it. Then, think about ways to learn from that failure, to keep going and to still be open to taking risks. Accept that you’re going to miss the ball more than you’re going to hit it. Then, think about ways to learn from that failure. It’s a growth mindset that when you recognize something as a ‘failure,’ you are not shutting the door and saying you’re a bad writer and you should stop. You need to tell yourself that being a good writer takes practice. Ray Bradbury actually said, “To be a good writer, you have to write several thousand or hundred thousand throwaway words.” That’s one thing I tell people with NaNoWriMo, especially the beginning writers. You’ve got to write one novel, two novels, three novels to really learn how to write a novel sometimes. Most people don’t get it on the first shot. It’s rare. It’s wonderful when that happens, but it’s rare. This is the nature of art or any creative endeavor. You fail more than you succeed, but you can cultivate that growth mindset and succeed a little more often or when you do fail, fail better. There’s also the premise that more ideas are better than fewer ideas. Getting more ideas leads to more likely success. I like quoting this story that there was a study by a ceramics professor. Let me think if I can remember this. Half of his class was graded on if they could just make one perfect pot or ceramic piece. The other half of the class was graded on the weight, the volume of things they produced. What the teacher found was that the students who produced for quantity, what they produced was actually better than those who were focused on the quality of one piece. That’s because they were taking a lot of risks and they were open and they were accepting failure. They didn’t care. 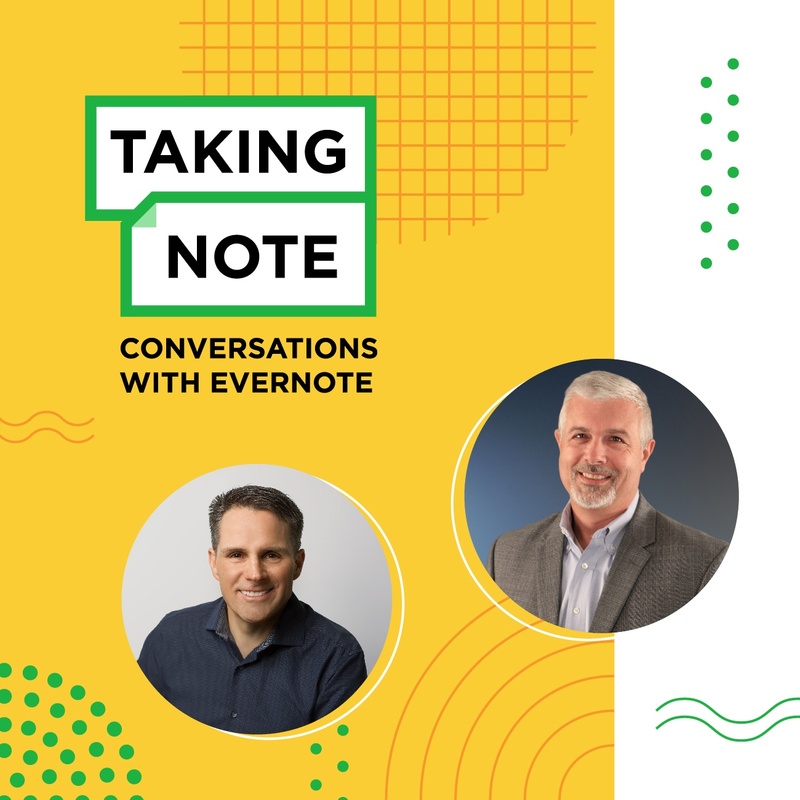 Evernote is proud to be a sponsor of National Novel Writing Month. 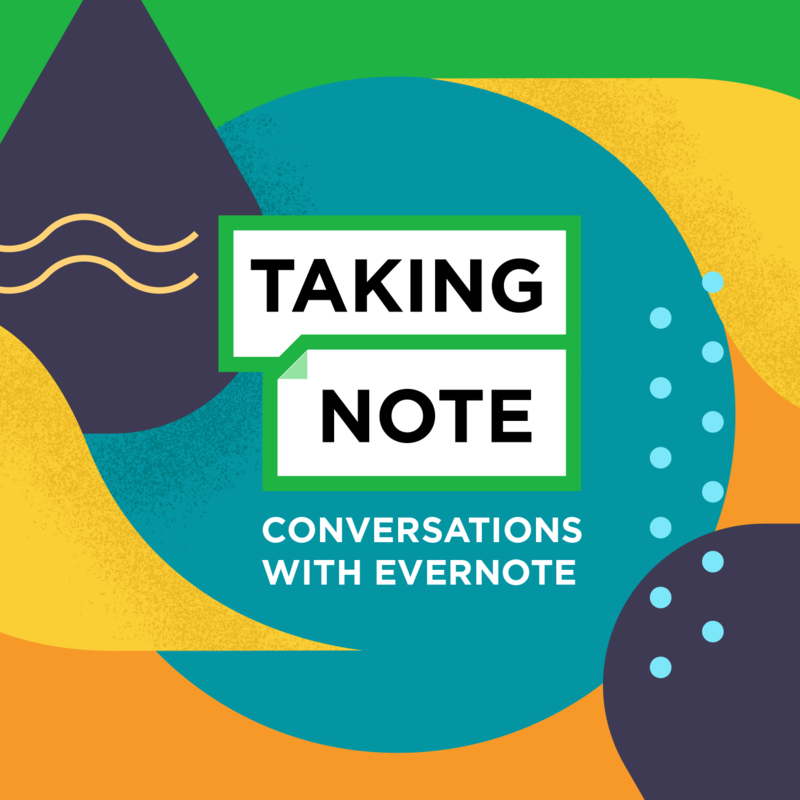 If you’re up to the challenge, sign up for free at nanowrimo.org, then come visit Evernote on the NaNoWriMo forum and let us know how your novel is coming along! We’ll post more tips and strategies to our blog throughout October and November. Did you enjoy this podcast episode? Please visit us on iTunes and leave a review! We would love to hear your feedback. 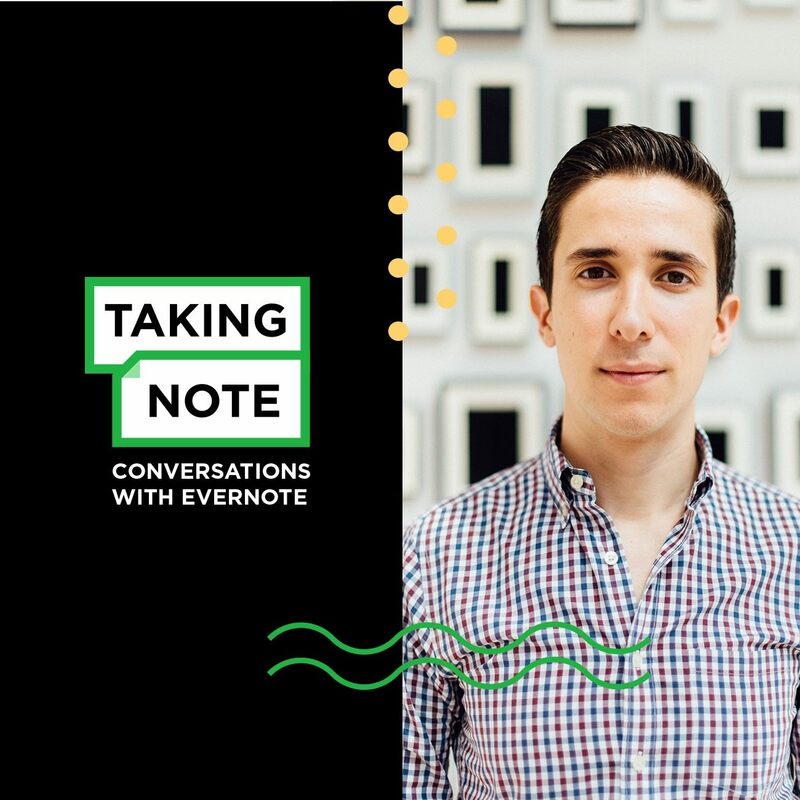 To get notified when a new episode has been released, don’t forget to subscribe to the Taking Note podcast on iTunes, SoundCloud, Overcast, or your podcast platform of choice. Thanks for listening! How do companies maintain performance and culture when their employees aren’t on site? We asked two global team leaders for their tips. Are you a creative person? Allen Gannett, author of "The Creative Curve" and CEO of TrackMaven, says that's the wrong question. Shane Snow reveals how dream teams rely on pushing the boundaries of comfort zones to tap into a group's potential energy and discover novel ideas & solutions.